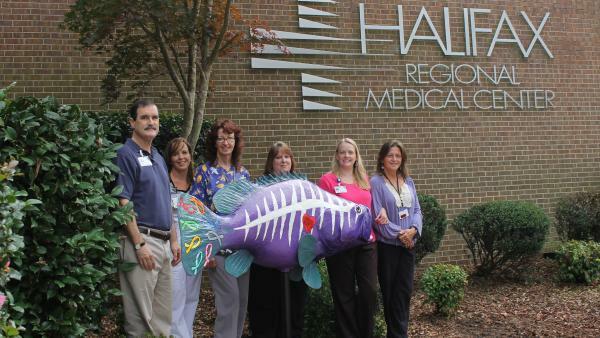 Halifax Regional Medical Center, in collaboration with The Halifax County Convention and Visitors Bureau, was excited to unveil the newest rockfish, on permanent display outside the main hospital entrance. A group of five Halifax Regional employees took part in designing and painting the rockfish, finding inspiration in the healing and caring work they do each day. Participating employee “artists” include: Pamela Whitfield, Wanda Catt, Heather Mitchell, Donna McKibbon and Lori Moseley, all representing different departments. The rockfish is painted purple to reflect Halifax Regional’s brand color, and the color of the American Cancer Society’s Relay for Life to bring awareness to various types of cancer and other diseases. The red heart represents the caring hearts and healing nature of the entire staff. The colored ribbons on the tail acknowledge: Red: AIDS, Heart Disease Awareness; Blue: Colon Cancer, Bullying Awareness; Teal: Ovarian Cancer Awareness; Green: Traumatic Brain Injury Awareness; Yellow: Bone Cancer Awareness, Support for Troops; Pink: Breast Cancer Awareness; Grey: Diabetes, Asthma Awareness; and Orange: Leukemia, Multiple Sclerosis Awareness. Halifax Regional Medical Center began as a hospital with just ten beds and 100 years later is still here. The proud history is built on the care and commitment. We're fully accredited by the Joint Commission on Accreditation of Healthcare Organizations, and licensed for 204 beds, including 24-hour emergency care. Backed by the latest technology, HRMC offers a compassionate environment where approximately 800 employees, and over 60 physicians representing most medical specialties, can deliver the best care every hour of every day. The centers and clinics include: birthing center, cardiac & vascular center, digestive health center, Halifax Healthlink, cardiology, Halifax Works, joint center, mammography center, minimally invasive surgery center, physical therapy services and more.